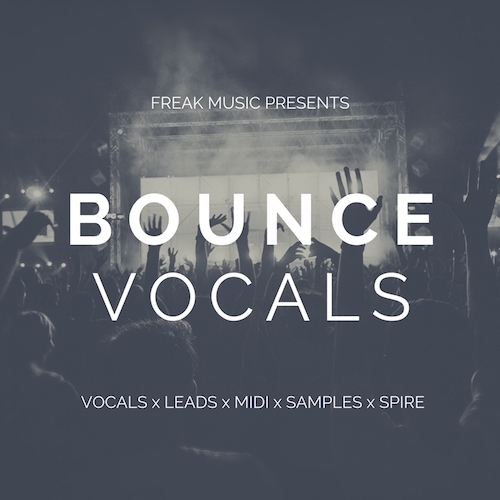 Freak Music is proud to introduce the “Bounce Vocals” – collection of bouncy lead loops, vocal loops, samples, presets and MIDI Files. Each melody kit is key and tempo labeled and comes with all elements, so you can flexibly compare different sounds and make your own, original progression with the files included. As always, each melodic part is available as a MIDI file. The content in this pack has been inspired by producers such as Timmy Trumpet, TJR, Deorro, Vinnai, Redfoo, R3hab and many others. Everything is carefully processed to perfection at 24-bit WAV quality. To access presets and soundbank, you need Reveal Sound’s Spire v1.1 or above.